The Mill, Cressbrook, is a very spacious, fully equipped three bedroom holiday apartment within the converted 18th Century Cressbrook Mill, Monsal Dale within the Peak District National Park. The Mill has two double bedrooms and one twin bedroom, a well equipped luxury kitchen, dining room, lounge, shower, bath and two WCs. Shared landscaped gardens surround The Mill with many seating areas for the use of residents and guests, along with a large astroturf bowling green and shared games room. The Mill is situated on the banks of the River Wye within the picturesque Monsal Dale, just a few minutes walk or cycle from the popular Monsal Trail. Starting from The Mill you can enjoy a tranquil riverside path walk, as well as enjoying many footpaths and bridleways, or quiet rural roads ideal for cycling. Have a look at Cressbrook Mill Facebook page for more recent photos. Enjoy the varied views from all the windows in the apartment. The living room looks out over the River Wye and the hills of Monsal Dale. From the hallway you get views down the valley towards Monsal Head. The kitchen has views over the old mill race which has the soothing sounds of water running through it. We bought The Mill whilst living overseas so we could use it as our UK base during long school holidays. It is therefore fully equipped as a family home rather than being equipped as a basic holiday rental. One large superking-size bedroom, one double bedroom and one large twin bedroom sleeping a total of six people, luxury kitchen, dining room, lounge, bathroom with WC, bath and shower and separate cloakroom with second WC. The master bedroom has a superking size bed, two windows overlooking Monsal Dale and the River Wye, fitted wardrobes and a two-seater sofa. It can be set up as two twin beds upon request. The spacious twin bedroom is the same size as the master bedroom with fitted wardrobes and views over the bowling green and Monsal Dale. The second double bedroom is located near the entrance of the apartment and has an arched ceiling as it was originally a store room within the mill. The well equipped, high quality kitchen has granite worktops and Neff appliances - dishwasher, double oven, hob, american fridge freezer, microwave and Nespresso coffee machine (bring your own pods). The kitchen is open-plan onto the large dining room with a dining table comfortably seating six. The dining room has double-aspect over the river Wye and surrounding Monsal Dale. Glazed double doors lead through into the lounge with two large sofas and separate armchair. The bright lounge is well equipped with flatscreen HDTV and Blu-ray / DVD player. Free wifi is provided. The large bathroom has a shower cubicle, separate bath and WC. There is a separate cloakroom with a second WC. We also provide a washing machine and separate tumble dryer in the apartment. There are many outside seating areas to choose from in the mature landscaped gardens. 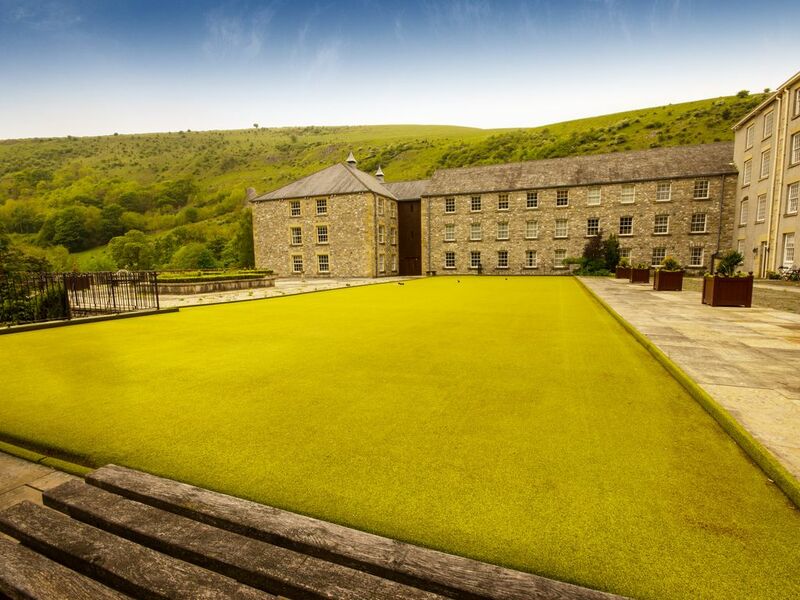 Within Cressbrook Mill, for the free use of guests staying at The Mill, is a large astroturf bowling green (bowls provided) and a games room with full sized snooker table, pool table, table tennis, air hockey and some exercise machines. Outside of peak season, we don't have fixed changeover days so you can start and end your holiday on a day that suits you. The Mill will be available for your use from 3pm on the day of arrival up until 10am on the day of departure. For bookings of four nights or more, earlier arrival / later departure may be available depending on other bookings and cleaning schedules - contact us a few days before arrival to see if we can accommodate this. In the underground parking we have a bike lock anchor point securely set in the concrete floor for locking bicycles to - please bring your own bike locks. Travel cot and high chair available. Guests need to provide own cot bedding. Please note: The Mill is a first floor apartment, accessed via a wide stone spiral staircase. Smoking is not allowed in The Mill apartment or common areas within the mill complex. I live with my husband and two teenage children in Derby and use the mill ourselves as an ideal weekend break less than one hour from our home. We bought The Mill whilst living overseas so we could use it as our UK base during long school holidays. It is therefore fully equipped as a family home rather than being equipped as a basic holiday rental. We love The Mill for its peaceful 'away from it all' location on the banks of the River Wye. There are many walks directly from the doorstep, either along the river, up and over the hills or along the Monsal Trail - a disused railway line given over to walkers and cyclists. The apartment is located in a new-build wing of the mill and is therefore very well insulated. The apartment is more than adequately heated by electric storage heaters. Luxury kitchen with Neff appliances - dishwasher, double oven, hob, american fridge freezer, microwave and granite worktops. The kitchen is open-plan onto the large dining room with a dining table comfortably seating six. Wine and champagne glasses provided. Freesat with HDD recorder for those unmissable programmes! A selection of books to read. One mountain bike available for guests to use. The Mill is accessed via a wide stone spiral staircase. Fly fishing day tickets are available for fishing in the river just outside The Mill. Stayed for a week. Excellent accommodation. Lovely views. Quiet location. Ideal for biking/walking along the Monsal trail. Highly recommended. Fantastic location and the property was very well presented. We stayed over the Christmas week, the property was extremely well equipped and very spacious. There are many good walks in the area that are accessible without the need of a car. Chatsworth and Bakewell are only a short distance away. Beautifully located, lovely property, thoroughly enjoyed our stay. Well equipped the apartment provided a great venue for an extended family get together. There are many varied walks available from the door, some easy and flat along the Monsal trail others more challenging. We stayed for 5 days in the apartment with our two kids. It was perfectly clean and very spacious. The equipment was perfect. We had everything we could have asked for. Even toys for kids! Everything was well explained and very well organized. Highly recommended. The appartment was very comfortable, and well-equipped. Perfect setting for a holiday. Lovely to be able to walk out of the door and get straight to the beautiful walks in Monsal Dale, as well as being very convenient for other villages and Chatsworth House. The Peak District is an ideal location to enjoy the beauty of the British countryside. ​The Monsal Trail (less than a mile) is a 9 mile long disused railway line that has become a very popular with walkers and cyclists. The trail passes through four tunnels and over the Headstone Viaduct which was used in posters to promote the former railway line. The line extends to the former station at Bakewell (4 miles). Along the route to Bakewell is Hassop Station which hires bikes and has a very good cafe. Bakewell (4 miles) is an ancient market town that holds a weekly market (Monday), a monthly farmers market (last Saturday of each month) and the annual Bakewell Show (August). Bakewell has a supermarket, many independent shops, outdoors shops and many pubs and restaurants. Tideswell (3 miles) is a very picturesque local village with a number of pubs and food shops, as well as a large 14th century church known as 'the Cathedral of the Peak'. Buxton (11 miles) is a famous spa town and home of the Buxton Opera House which hosts many cultural events throughout the year. Buxton has a larger shopping area than Bakewell, with many high street names and a Waitrose. Blue John Cavern (11 miles) is a series of limestone caverns famous for the Derbyshire Blue John stone. Edale (14 miles) is the start of the Pennine Way and on the edge of the Kinder Scout moorland plateau, as well as being at the foot of Mam Tor which is a popular location for walkers and paragliders. The River Wye (less than a mile) is one of the UK's top trout rivers. Day tickets for fly fishing are available from Cressbrook and Litton Fly Fishers. There are many opportunities to eat out nearby. The nearest is the Monsal Head (1 mile) overlooking Monsal Dale with two restaurants - this is our favourite place to sit outside and enjoy the sunset with either a local ice cream or beer. Both Litton (2 miles) and Tideswell (3 miles) have a number of fine pubs, the Angler's Rest in Millers Dale (2 miles via the Monsal Trail) is a traditional pub that serves many real ales. For an upmarket meal Baslow (7 miles) has a Michelin Starred restaurant - Fisher's at Baslow Hall as well as a number of other high quality restaurants - we highly recommend Rowleys . Weekly prices are to rent The Mill for seven nights. Outside of peak season, we don't have fixed changeover days so you can start and end your holiday on a day that suits you. The Mill will be available for your use from 3pm on the day of arrival up until 10am on the day of departure. For bookings of four nights or more, earlier arrival / later departure may be available depending on other bookings and cleaning schedules - contact us a few days before arrival to see if we can accommodate this. Short breaks of three nights or more are available at reduced prices outside of school holidays / Christmas.